In a large pot or Dutch oven, toss cabbage, apples and onion. Add water, vinegar, sugar, butter and salt. Place the peppercorns, allspice, cloves and bay leaf on a double thickness of cheesecloth; bring up corners of cloth and stir with kitchen string to form a bag. Add to Dutch oven. Bring to a boil. Reduce heat; cover and simmer for 1-1/4 hours. Discard spice bag. 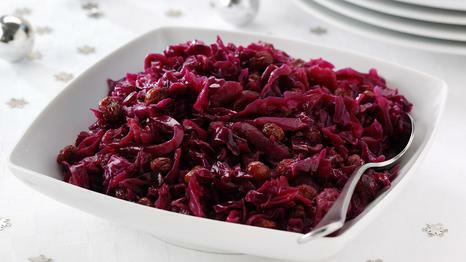 In a small bowl, combine cornstarch and cold water until smooth; stir in cabbage mixture. Bring to a boil; cook and stir for 1-2 minutes or until thickened. 1 Pings/Trackbacks for "Rotkohl – Red Cabbage Recipe"